It’s not uncommon for users of LTO tape technology to “skip” a generation between upgrades. In large part, this has been influenced by the increase in capacity and/or performance as well as the ability to read back two generations. 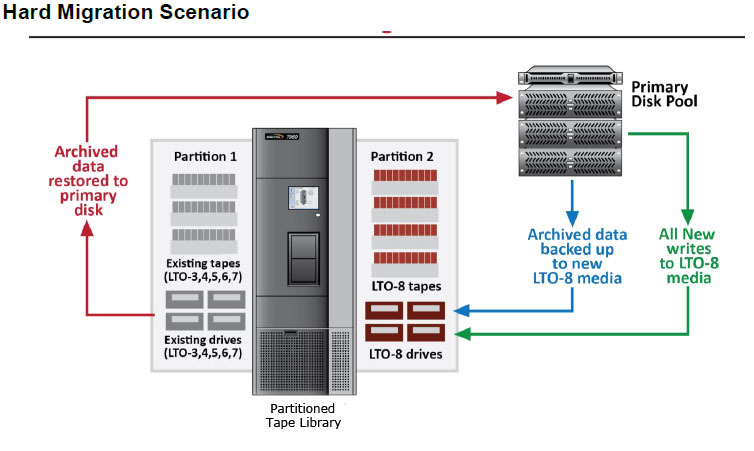 The increase in capacity from LTO-5 to LTO-6 was modest – going from 1.5 TB to 2.5TB per tape cartridge (native). Understandably, many felt the increase in capacity was not significant enough to compel an upgrade. Those users may have chosen to wait until LTO-7 was available. The increase from LTO-6 to LTO-7 was much greater in both capacity and performance. At 300 MBs performance and 6 TB per cartridge capacity (both native), LTO-7 was an impressive upgrade. Users who skipped the LTO-6 upgrade (remaining on LTO-5 until the release of LTO-7), saw an increase in capacity of 300 percent and an increase in performance of 115 percent over their prior LTO-5 tape technology. Skipping a single generation still allowed users to read all of the media in their tape library with the new drive technology since we had the ability to read back two generations. Most users upgraded all of the tape drives in their system, continued to do reads or restores from their older LTO-5 media, and used new LTO-7 media for all writes. There was no drawback to skipping a generation between releases. 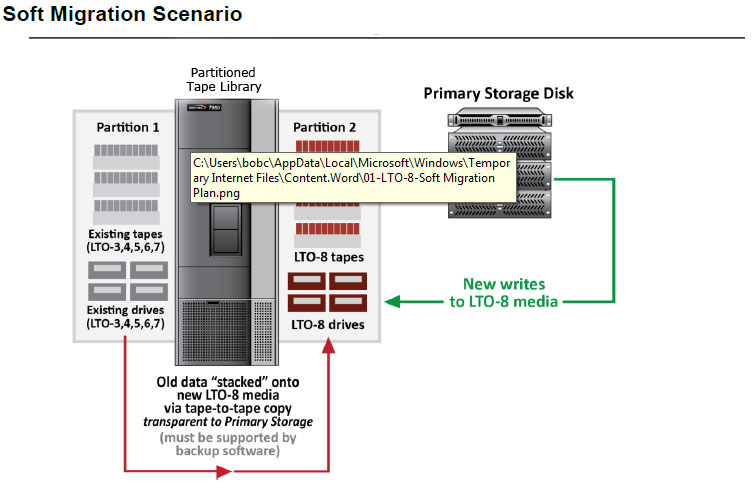 If users skipped two generations LTO-4 to LTO-7 they had to consider what to do with a generation of tape (LTO-4, in this case) which could no longer be read by the new LTO drives (LTO-7). Today, both of the above scenarios have changed. We are seeing much larger increases in capacity between LTO-7 and LTO-8 (100 percent). The LTO roadmap suggests these significant increases will continue between future LTO releases. This makes for a much more compelling argument in upgrading between each release. Likewise, the ability to read/write back a single generation makes a more compelling argument for upgrading between each release to make forward migration and data access easier. Which data tapes need to be migrated and which do not? Most data centers will have a very large number of tapes, not only in the library but also archived – onsite, offsite or both. Obviously it would be ideal to simply have all data stored on old media to be converted to the new media. But in many cases this is not necessary, or for that matter, practical. It may be helpful to determine which data sets need to be migrated before determining the tape technology needed for the migration. Ideally users can categorize to some extent which media will be migrated and which will not. Media aging out in the near future (“near future” being defined by the user) should be allowed to age out and removed from the migration pool. There are data sets which are highly likely to never be accessed again on one end of the spectrum and data sets which are very likely to be recalled on the other end. Below is a general categorization of parameters to consider when embarking upon migration and calculating both the time and resources which will be required. We use the term “active archive” to refer to archived data that has a high likelihood of being accessed in the future and also has a significant retention life. a) The tapes which hold this type of archived data are the highest priority for either soft or hard migration (explained in the following section). b) Active Archive tapes will hereinafter referred to as “high-touch” media. Here we’re referring to the tapes used to perform ongoing daily and weekly backups. The value of any given backup set diminishes quickly. Once a given set of full and incremental backups is followed by the next week’s set of full and incrementals, the value of the first set is significantly reduced. Users typically go to the most recent backup copy for restoration. Although the words “backup” and “archive” are sometimes used interchangeably, in this discussion we do not consider a set of backups as “archive” data. Archive data will be discussed next. a) New backups will immediately be directed to the new library. b) In most instances existing backup tapes are never migrated to the new library. In some instances approximately 90 days’ worth of backup sets may be migrated. c) Backup tapes will hereinafter be referred to as “no-touch” media. Here we’re referring to data which has specifically been archived for compliance mandates – usually dictated by government or industry policies. b) User usually has a long window for finding and recalling. c) We are suggesting it not be migrated if lifespan is down to less than three additional years. d) If not migrated to new media, the user will require at least one drive for the duration of the compliance retention period which is compatible with the media set retained. e) Compliance archive tape will hereinafter be referred to as “low-touch” media. Even a low-level categorization of which tapes need to be migrated and which can remain on current media generation will greatly help in laying out the migration plan and/or how new tape drive generations will be incorporated into the existing system. A “hard migration” refers to restoring data from existing backup and archive tapes to primary storage and then backing it up again to the new tape drives and media. One might also refer to this as a “traditional” migration. The current tape library will be partitioned for LTO-6 (or older) LTO media and drives as well as a separate partition for new LTO-8 media and drives. Partitions which are dedicated to older LTO generation drives and tapes will hold the existing “high-touch” and “low-touch” data mentioned above. The backup/archive software will be directed to restore the data from older generations of LTO media to disk. The backup/archive software will then be scheduled to re-write those data sets to the new LTO-8 media. This process will continue until all media designated for migration is moved to LTO-8 media. Since this requires a full restore and rewrite, it is performed in the background as time and resources allow. Simultaneously, new writes will be directed to the LTO-8 partition. When all data/media is migrated, the library partitions dedicated to older generation media and drives can be reduced in size and used for the rare restoration of data designated as “no-touch” until the retention period for that remaining data has passed. At that point, all older LTO partitions will be de-commissioned. The challenge of the hard migration, outlined above, is that there must be sufficient storage space in primary data storage to restore older information before backing it up again to the new media. “Soft” migration refers to a migration process which does not require the older information be restored before being written to the new media. This is a function of the specific backup/archive software application being used. It’s often referred to as “tape stacking” or “tape-to-tape copy.” Not all backup applications support these features and not all support them in the same manner. For those that do, information from older tapes can often be “stacked” onto the new tape media without having to be restored first. Due to the fact that data doesn’t need to be restored first, the process can run in the background during low periods of use for the tape library. A soft migration is typically completed more quickly. The above diagram for soft migration also denotes partitions being setup for older media and drives to keep them segregated from the new media and drives. This can always be done via the Tape Library. It is possible to accomplish this via the backup/archive software if the software supports a feature often referred to as, “Media Pool Functionality.” This feature allows the software to designate media pools and identify media and drive type without creating a virtual partition within the library. This can be preferable, as often software applications charge a license fee for virtual partitions created by the library itself. The software would see this as two libraries. Obviously, a full understanding of both the software and hardware involved in migration is imperative. In the appendix of this white paper we show a partial list of independent software vendors we believe are able to support tape stacking and media pool functionality which may make soft migration possible. These terms may vary from vendor to vendor, but the concepts will be clear. Please confirm your software’s ability with the given manufacturer before planning migration. The goal of both hard and soft migration is to eventually move all data from older LTO media to LTO-8 media. While multiple partitions, or divisions of media and drive types, can be maintained in the tape library indefinitely, as mentioned above, some backup applications may charge licensing fees based on number of drives or partitions being used. In that situation, it would be ideal to minimize the number of partitions and/or drives being used. A hybrid approach, utilizing both hard and soft migration, could be used by data centers who wish to maintain older LTO media in the tape library for an extended period of time. All new writes go to LTO-8, high-touch data could be migrated in the background, and the low-touch data could be left on older media indefinitely as long as a partition configured with that LTO drive type is maintained. The only “forced” migration would occur as LTO drive types reach end of support life. As mentioned above, the backup or archive application used to create backups or archives can play a key role in introducing new generations of tape drives or migrating existing backup/archive tapes from one generation, or even a different type of media, to another. If an organization is preparing to do a full migration of all data and media, it may be a good time to evaluate their current backup/archive software. If a new backup or archive application is being considered, this would be an ideal time to make such a change. The ability to designate media pools and stack older tapes onto newer tapes without a full restore (described above under soft migration) are two features which will assure that future migrations are performed as easily as possible. Contact BackupWorks today at 866 801 2944 let's implement the most effective and economical migration path possible.